Masters in Hospitality Management - Hospitality Management is a multidisciplinary field of study with the purpose of preparing people with the expertise, commitment, and skills for management, marketing, and operations positions in the expanding industry that provides food, accommodations, and other services to people that are away from home. It draws upon a wide range of basic disciplines to provide the fundamental knowledge and skills that are required to fulfill the diverse demands placed upon individuals in management positions within the hospitality industry. The institutes that provide courses in Hospitality/Hotel Management are Kurukshetra University, IHM Aurangabad, Jammu University, Amity University, Bundelkhand University, West Bengal University, Siksha 'O' Anusandhan University, Yashwantrao Chavan Maharashtra Open University. Amrita University MHA Admission 2019 - Amrita Vishwa Vidyapeetham, invites applications for admission to Master of Hospital Administration (MHA) Course for the academic year 2019 at Amrita Health Sciences Campus, Kochi. Jammu University MBA (HT) Admission 2019 - Jammu University invites applications for admission to the two year full time Master of Business Administration in Hospitality & Tourism (MBA-HT) in the school of hospitality and tourism management, Faculty of Business Studies, University of Jammu, Jammu commencing July/ August 2019. Anna University Distance Education - Anna University has released notification for admission to the MBA, MCA, M.Sc. (Computer Science) Programmes through Distance Mode. Anna University Conducts Distance Education Test (DEET) for admission to MBA, MCA Courses for the Calendar year 2019 Batch. CCHMCT BSc Hospitality & Hotel Administration Admission 2018 - Chandigarh College of Hotel Management, Catering Technology (CCHMCT), Noida announces filing of seats for admission to first year of 3-year B.Sc. Hospitality and Hotel Administration Program for academic session 2018-19. NCHMCT MSc Hospitality & Hotel Administration 2018 -NCHMCT & IGNOU jointly announced admission for 2-year M.Sc. Hospitality. National Council for Hotel Management and Catering Technology (NCHMCT), Ministry of Tourism, Govt. of India invites online applications for the National Hospitality Teachers Eligibility Test 2018 - March (NHTET-2018). Panjab University PUTHAT 2018 - University Institute of Hotel and Tourism Management (UIHTM), Panjab University, Chandigarh invites admission application for four-year program for the academic session 2018-19. 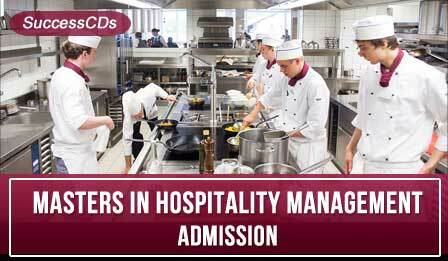 Hospitality Career Scope, Eligibility and Job Prospects, Overview, Admission, Training Institutes. Bharati Vidyapeeth Deemed University conducts BVP B-MAT for admission to MBA Program. B-MAT 2018 is organized by the Bharati Vidyapeeth Common Entrance Test (CEL). Interested and eligible candidates can submit BVP B-MAT 2018 application form and appear in Management Admission Test.